De laggende Law, de treurende actionist met de smekende Mercurius. [Law laughing, the shareholders mourning, and Mercury entreating.] - [ANONYMOUS]. 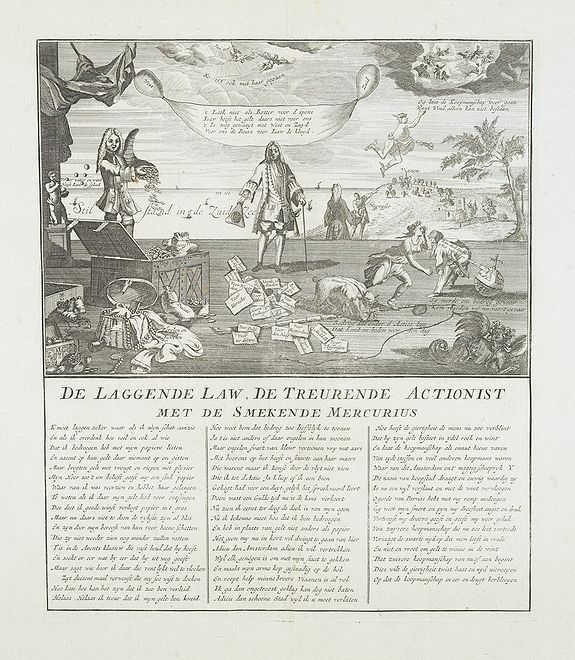 Title : De laggende Law, de treurende actionist met de smekende Mercurius. [Law laughing, the shareholders mourning, and Mercury entreating.]. Size : 13.2 x 11.2 inches. / 33.5 x 28.5 cm. Description :Page taken from Het groote tafereel der dwaasheid : vertoonende de opkomst, voortgang en ondergang der actie, bubbel en windnegotie, in Vrankryk, Engeland, en de Nederlanden, gepleegt in den jaare MDCCXX. A caricature in prose and verse satirizing the disastrous Mississippi scheme (1718-1720) of the French Compagnie d'Occident and the speculations its stock that led to the complete ruin of many of its over-eager French, Dutch and English shareholders. John Law (1671-1729), the son of an Edinburgh banker and successful financier who established the "Banque Générale" in France in 1715, founded the Compagnie de l'Occident for the exploitation of the resources of French Louisiana after Antoine Crozat had surrendered his charter in 1717. Law's reputation caused the stock to sell readily, and the organization soon enlarged the scope of its activities by absorbing other commercial companies, its name than being changed to the 'Company of the Indies'. Enormous profits were anticipated...and the increasing demand for its stock led to wild speculation. The anticipated immense and immediate profits were not realized, and soon the scheme revealed itself as a purely speculative venture. In 1720 the company failed, the 'bubble' bust, and the stockholders lost their entire investment, many being completely ruined. Read more about "Het Groote Tafereel der Dwaasheid", or "The Great Mirror of Folly" or view several of the seventy-four plates from this book. A.H.Cole, The great mirror of folly, 1949. Condition : Good margins. Good and dark impression.